On death, respawns with one less HP. When Dreadsteed dies with 1 HP left, dies permanently. In-element somewhat death trigger for Death. Numbers might need to be tweaked, but otherwise, should be pretty self explanatory. Inspiration drawn from the Hearthstone card of the same name. I like this card. Though it's rather powerful with fractal. 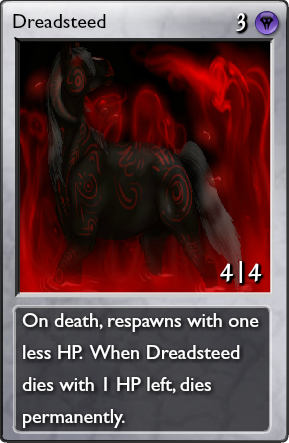 For clarity, Dreadsteed spawns with one less MAX HP, not just regular HP. Please include a direct link for the art source. What you're telling me is that I have to waste 3 cards worth of creature control to completely annihilate this creature or drop its HP to 1 before I kill it, which is almost impossible if I'm not running poison or dry spell? Broken. Especially with six of the same creature. "How well will you die?" Phoenix isn't much better, you know. Yeah, but this respawns instantly and doesn't take any quanta to do so. Immortal trades with infinite lightnings what's up with that?